Our change in plans from camping in the Beartooth mountains to a motel in Gardiner freed up a day in Yellowstone. But we had campsite reservations so rain or not, we were headed south through the park. After a lazy start to the morning and with no real plans, we headed out to go with the flow. First up was a stroll around the boardwalks at Mammoth Hot Springs. Steam and fog swirled off of stair steps carved out of mountain slopes by erosion. 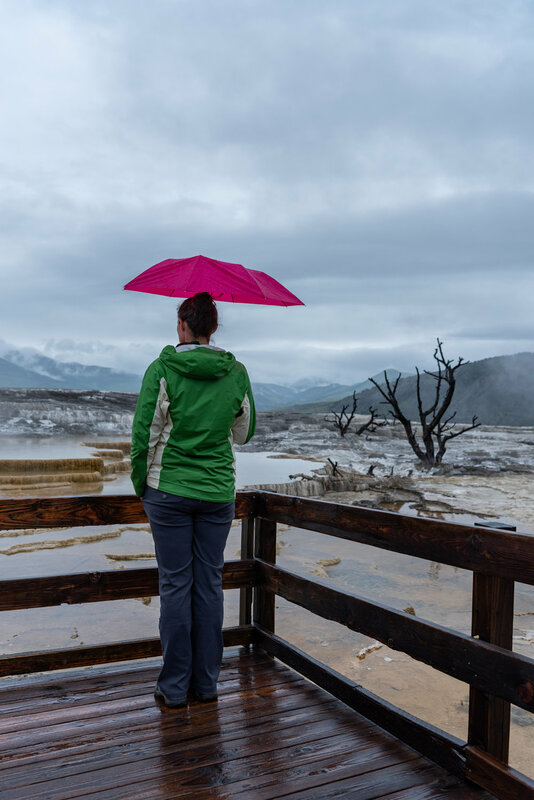 We saw bubbling hot springs and views down into the Mammoth Springs area. The geyser area here is large and we ended up walking about a mile. You could easily shorten this if small feet started dragging. This particular geyser area is really quite lovely but if you are staying on the southern or western sides of the park, there are other good options at Norris, Old Faithful, etc. Definitely do this hike if you are near but don't worry about driving too far just to see this particular place. As the rain started to thin, I convinced Kelly to try a 'real' hike. So, further down the northern cutoff between west and eastern sides, we decided to hike out to Ice Lake and then to GIbbon waterfall in a small loop that would require just a short amount of road walking. The trail out to Ice Lake was muddy but flat, making this a very family-friendly hike. Shortly after the last viewpoint of Ice Lake, we came across the Gibbon river. Water was flowing so high it wasn't passable. Like racing waist high. Alas, the full loop was not in our cards. We turned around and retraced our steps to the car. There was nothing particularly noteworthy about this hike but a few campsites along the lake would be perfect for novice backpackers looking for an easy location. One of the sites was even handicap accessible. How cool is that! This mostly level trail had us doing an out and back to the northern coast of Yellowstone Lake. It felt like we were back in Acadia National Park with rocky coastline along the shores of the lake. 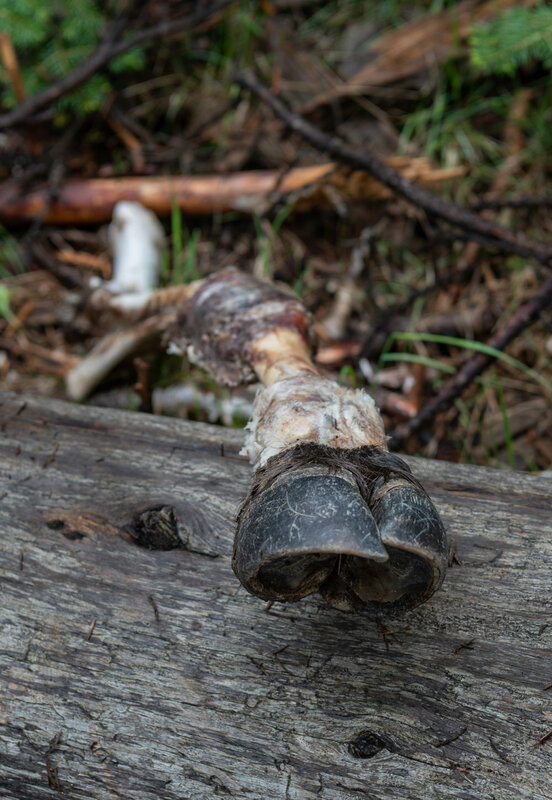 We passed pieces of bison carcass in the forest between the marshy trail head and the lake coastline. It definitely added a sense of excitement to the hike! Seriously, this was an awesome short hike in the park. Gives you a feeling of the Yellowstone wilderness that isn't the geysers without being too remote. 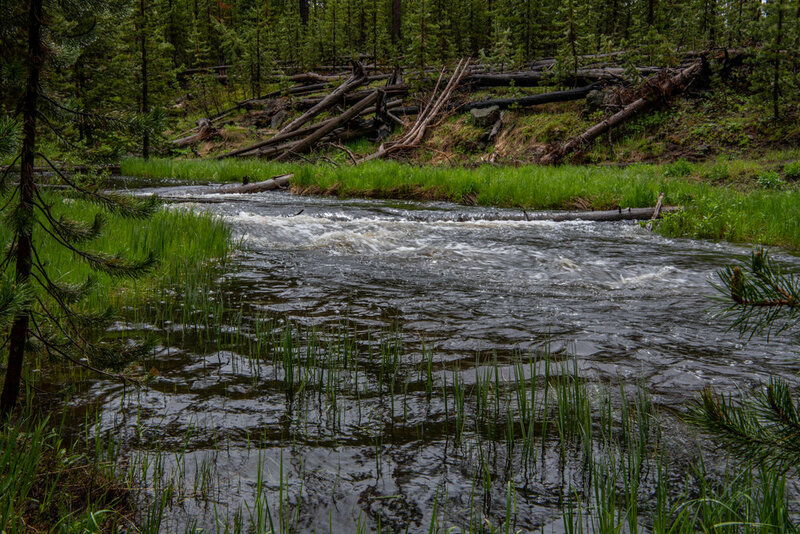 It's also on the southern side of the park, and perfect if you are venturing up to Yellowstone from Tetons. After these hikes and setting up camp, we drove up to Hayden Valley for wildlife and sunset viewing.